Three awards have been achieved by the Department of Biology in one month. Dr. Ir. Iman Rusmana M.Si. was elected as Outstanding Head of Department (1st) in IPB. Prof. Dr. Ir. 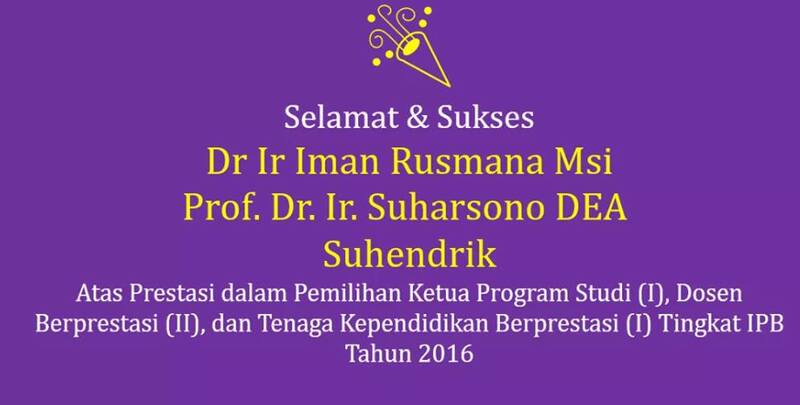 Suharsono DEA was elected as Outstanding Lecturer (2nd) in IPB. Suhendrik Tjiam was elected as Outstanding Supporting Staff (1st, category of Academic Administration) in IPB. Congratulations on your success! You have made us all proud. Keep up the good work!. Thank you for all those who have participated to accomplish this achievements.